Venture investments in the U.S. and Europe increased 50 percent over 2017, setting a record. 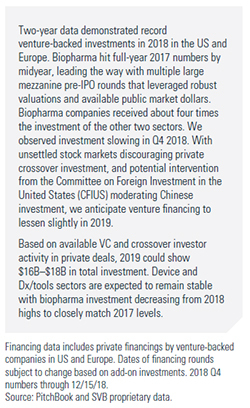 The growth in biopharma dollar volume doubled that of 2017 and was about four times that of device and diagnostics/tools volume in 2018. Large pre-IPO mezzanine funding in biopharma drove this increase, with over 50 private venture deals of $80 million or more. 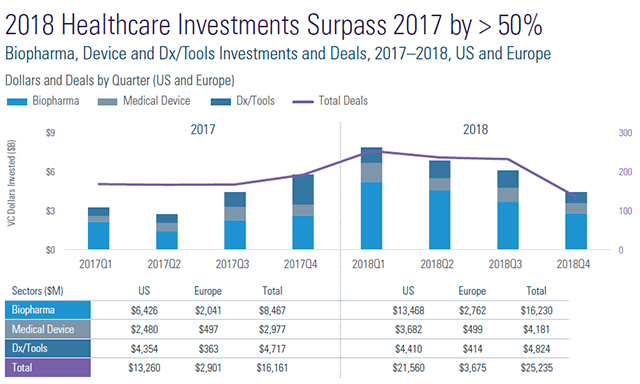 Device investment swelled 40 percent in 2018, while diagnostics and tools investment remained stable. Biopharma Series A dollars increased 35 percent over 2017 to more than $4 billion, led by oncology and platform companies, which accounted for more than half of all deals and dollars. However, there was an overall decrease in the number of deals, meaning that very large Series A deals drove the 2018 jump. We also noted a decline in corporate venture investment as part of early-stage syndicates. This was partly driven by crossover investors such as RA Capital, Perceptive, Cormorant and EcoR1, which have become prolific early-stage, pre-IPO investors. The crossover value proposition is typically a nice step-up in valuation, but just as important is the addition of a significant follow-on investor in the IPO. We noted that 69 percent of 2018 IPOs in biopharma had participation by the top 15 most active crossover investors in their last private round. Reflecting an optimistic view of the IPO window, these crossover investors restocked biopharma IPO pipelines by funding 60 new private companies in 2018. Biopharma exits were dominated by IPOs, which accounted for 70 percent of the record $49.3 billion in exit values in 2018. There were 18 $1 billion-plus exits in 2018. 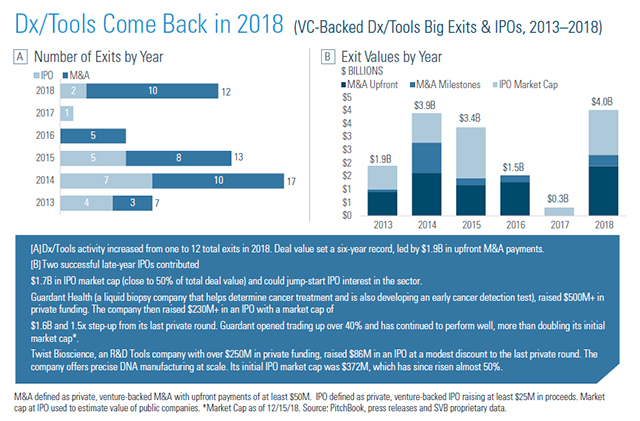 Four exits were private venture acquisitions, four were pre-2018 IPOs that were acquired in 2018 in the public market, and 10 companies that exited via IPO in 2018 achieved $1 billion-plus market caps by the end of the year. The total number of IPOs fell short of the 2014 record (66 to 54), but new IPO highs were set in median pre-money valuation ($325 million) and median dollars raised ($100 million). The number and deal size of M&A transactions decreased in 2018, as most companies raised large rounds and pursued the public market. However, the alternative was to raise fewer dollars and look for an M&A deal. The 10 early-stage private companies that did achieve a merger or acquisition had small dollars invested (median of $17 million), very early data (pre-clinical or phase I), and quick exits (median of 2.9 years from close of Series A). These early exits received lower upfront payments ($100-200 million), but the multiple on invested capital was significant, with a median upfront multiple of 5.4x and a total deal multiple of 22x. Device investment grew 40 percent in the U.S. and Europe, and Series A dollars rose more than 30 percent to almost $1 billion. Cardiovascular, neuro, and ophthalmology indications led investment in Series A rounds. However, we also saw significant investment in surgical (specifically robotic surgery companies), non-invasive monitoring, and oncology. While Series A investment surged, most device investment (78 percent of the total) went into later-stage deals. Fresh off four IPOs in 2018, neuro received significant later-stage venture investment, with three $50 million-plus deals for Neuropharma, Reliveant Medsystems, and Stimwave. Meanwhile, urology/gynecology saw significant deals for Procept BioRobotics, Renovia, and AEGEA Medical. Cardiovascular investment was also active, with HeartFlow, Neochord, and Whiteswell all raising big rounds led by crossover investors. Device exits rallied from a flat performance over the previous two years. Nineteen M&A transactions tied a six-year high, and the $3.5 billion in upfront payments eclipsed both biopharma and diagnostics and tools. In addition, eight IPOs recorded cycle highs in median pre-money valuations and dollars raised. Boston stepped into the void left by Medtronic and Abbott by acquiring seven venture-backed, private device companies. Oncology, with four M&A exits, tied cardiovascular and orthopedics for the most M&A activity. 510(k) pathway deals continue to require FDA clearance and commercialization rounds before acquisition (32 of 34 exits since 2015), while PMA pathway companies typically get to an exit prior to FDA approval (23 of 26 since 2015). The De Novo 510(k) classification, with four exits since 2017, needed FDA approval and commercialization prior to exit, but had the best overall deal values and multiples. Tech investors continued to dominate new diagnostics and tools investments, making up seven of the 10 most active investors. Incubators and accelerators were also active in spinning out companies. Series A investments dipped in deals and dollars, particularly in diagnostic tests and R&D tools, as investors wait for things to play out, but diagnostic tools and analytics did see increased activity. 2018 R&D tools companies continued to raise money in the later stages, doubling investment dollars over the previous year with large private rounds for 10x Genomics, Twist, Zymergen, Berkeley Lights, and Ginkgo Bioworks—all at post-money valuations of over $400 million. Diagnostics and tools exits jumped to 10 M&A deals and two IPOs from very limited activity in 2017. Two successful IPOs late in the year by Twist Biosciences and Guardant Health set up the sector for more IPOs in 2019. M&A values continue to lag far behind the private valuations we see in venture financings, with a median M&A upfront deal value of just $105 million. Traditional acquirers continue to dominate the landscape and often look for commercialstage companies to add to their product mix, although we believe the larger technology companies will make significant healthcare plays in this sector over the next few years. We anticipate total U.S. venture fundraising for life sciences companies to continue at a healthy pace in 2019, reaching about $8 billion, with established funds likely to be joined by new spinout funds anchored by established investors. In addition, tech firms may raise life sciences-only sister funds. hurdles? Top 15 crossover investment in venturebacked companies could soften by 25 percent or more, leading biopharma investments to decrease and therefore more closely match 2017 numbers. The biotech IPO pipeline is strong, but market uncertainty could drag the number of IPOs down to 30 to 35 deals and moderately reduce pre-money valuations and dollars raised. As a result, we expect an increase in private biopharma M&A transactions. Device investments are expected to be stable, with additional growth in Series A. A strong performing group of later-stage, venture-backed companies shows promise for up to eight device IPO opportunities in 2019. We don’t expect much change in device M&A activity relative to 2018. The number of Series A deals in diagnostics and tools will likely climb in 2019, although overall investment dollars could lag following multiple larger 2017 and 2018 financings. Tech acquirers will likely scoop up a few diagnostics test and diagnostics tool and analytics companies, which could spur an uptick in M&A deal value. Further, we anticipate there could be two to four IPOs of revenue-generating R&D tools companies. As a Managing Director, Jonathan Norris spearheads strategic relationships with many healthcare venture capital firms. In addition, he helps SVB Capital through sourcing and advising on limited partnership allocations and direct investments. Jonathan speaks at major investor and industry conferences and authors widely cited analyses of healthcare VC trends. He has more than 18 years of banking experience working with healthcare companies and VC firms. Jonathan earned a B.S. in business administration from the University of California, Riverside, and a J.D. from Santa Clara University. The table below includes data from life sciences transactions in which Wilson Sonsini Goodrich & Rosati clients participated across the first and second halves of 2018. Specifically, the table compares—by industry segment—the number of closings, the total amount raised, and the average amount raised per closing across the two six-month periods. The data demonstrates that venture financing activity increased from the first half of 2018 to the second half of 2018 with respect to the total amount raised, and decreased with respect to the total number of closings. Specifically, the total amount raised across all industry segments increased 43.3 percent, from $1,353.44 million to $1,939.51 million, while the total number of closings across all industry segments decreased 8.4 percent, from 119 to 109. Notably, the industry segment with the largest number of closings—biopharmaceuticals—experienced a marginal decrease in number of closings but a significant increase in total amount raised from the first half of 2018 to the second half of 2018. Specifically, the number of closings in the biopharmaceuticals segment decreased a mere 4.3 percent, from 46 to 44, while the total amount raised increased 40.3 percent, from $528.57 million to $741.77 million. Similarly, the industry segment with the second-largest number of closings—medical devices and equipment—experienced a decrease in number of closings but an increase in total amount raised from the first half of 2018 to the second half of 2018. Specifically, the number of closings in medical devices and equipment decreased 41.9 percent, from 43 to 25, while the total amount raised increased 15 percent, from $321.48 million to $369.6 million. Meanwhile, the industry segment with the third-largest number of closings during the first half of 2018—healthcare services—experienced no change in number of closings but a significant increase in the total amount raised: the number of closings remained at 12, while the total amount raised increased 162.7 percent, from $183.47 million to $481.89 million. The industry segment with the fourth-largest number of closings during the first half of 2018—health IT—was unique among others in that it experienced increases in both number of closings and total amount raised. Specifically, the number of closings in the health IT segment increased 142.9 percent, from 7 to 17, while the total amount raised increased 674.1 percent, from $36.87 million to $285.4 million. The two remaining industry segments—genomics and diagnostics—both experienced decreases in total amounts raised from the first half of 2018 to the second half of 2018. The total amount raised in genomics decreased 88.2 percent, from $229.93 million to $27.23 million, while the total amount raised in diagnostics decreased 36.7 percent, from $53.12 million to $33.62 million. In addition, our data suggests that Series A (including Series Seed) financing activity and Series B financing activity, in each case as a percentage of all other financing activity, increased from the first half of 2018 to the second half of 2018, while Series C and laterstage financing activity and bridge financing activity as a percentage of all other financing activity decreased across the same periods. Specifically, the number of Series A (including Series Seed) closings as a percentage of all closings increased from 34.5 percent to 37.6 percent; the number of Series B closings as a percentage of all closings increased marginally from 15.1 percent to 15.6 percent; and the number of Series C and later-stage closings as a percentage of all closings decreased from 16.8 percent to 11.9 percent. Bridge financing activity as a percentage of all other financing activity decreased from the first half of 2018 to the second half of 2018, moving from 26.1 percent to 20.2 percent. Average pre-money valuations for life sciences companies increased for Series A (including Series Seed), Series B, Series C, and later-stage financings, from the first half of 2018 to the second half of 2018. The average pre-money valuation for Series A (including Series Seed) financings increased 80.7 percent, from $13.67 million to $24.7 million; the average pre-money valuation for Series B financings increased 96.6 percent, from $60.13 million to $118.2 million; and the average pre-money valuation for Series C and later-stage financings increased 37.1 percent, from $212.2 million to $290.96 million. Other data taken from transactions in which all firm clients participated in the second half of 2018 suggests that life sciences is now the the most active industry for investment among our clients. For the second half of 2018, life sciences represented 32 percent of total funds raised by our clients, while the software industry—historically the most popular industry for investment—represented 27 percent of total funds raised. Overall, the data indicates that access to venture capital for the life sciences industry increased in the second half of 2018 compared to the first half of the year, with the most active segments (in descending order of total closing activity)—biopharmaceuticals, medical devices, healthcare services, and health IT—experiencing significant increases in total dollars raised. Moreover, those dollars were raised at higher valuations across the board—for Series A (including Series Seed), Series B, Series C, and laterstage financings. This increase in access to financing at improved valuations should be a relief to entrepreneurs struggling to find money at the right valuations between the second half of 2017 and the first half of 2018. And, because early 2019 exit activity for our life sciences companies is strong across all industry segments, we would expect this recent increase in financing activity to continue during the first half of 2019. For many companies in the medtech and diagnostic sectors, identifying the next source of capital is high on the board’s agenda. While many companies opt to secure their next round of financing from venture capital firms, there is an alternative source of capital that is becoming increasingly popular. The London Stock Exchange’s Alternative Investment Market (AIM) offers access to a supportive, high-quality investor base within a flexible regulatory regime that allows companies to go public at a much earlier stage than would normally be expected for a listing in the U.S. In the life sciences sector, medtech and diagnostic companies that have secured FDA approval, are generating revenue, and ideally have international aspirations, are all potential candidates to raise money via AIM. This article explains the opportunity and why several North American companies have looked to AIM to raise money. AIM was launched in 1995 by the London Stock Exchange as an international growth market for small- and medium-sized companies to help them access capital from the public markets. Since AIM’s launch, more than 3,800 companies from around the world have traded on AIM, raising nearly £112 billion (approximately $144 billion) in funds. Companies on AIM operate in over 100 countries and represent 40 different sectors ranging from financial services to healthcare and technology. As of the end of December 2018, 89 of 922 companies trading on AIM were in the healthcare industry and they collectively raised over £480 million (approximately $617 million) on AIM during the period between January and December 2018. The London exchanges are inherently international in their outlook and there are more international companies listed in London—including approximately 120 North American companies—than on any other exchange. There is a particular opportunity for North American companies to take advantage of this route at the moment; for example, there were 21 North American (U.S. and Canada) listings in 2017,1 five times the 2016 number. Several U.S.-based healthcare companies, including Maxcyte (Maryland), Polarean Imaging (North Carolina), and Renalytix AI (New York), have raised money on AIM in the last 24 months. The institutions that invest through AIM are typically blue-chip investors with a focus on smaller growth companies. Examples include Invesco, Standard Life, BlackRock, Hargreaves Landsdown, and Schroders, among others. There is also a pool of tax-driven investors that can invest on AIM using the UK’s Enterprise Investment Scheme (EIS) and Venture Capital Trust (VCT) regimes, which benefit from various reliefs and incentives for investments into qualifying companies. The AIM investor base also tends to support the needs of growth companies and recognizes that follow-on investments will likely be required. For example, over the last five years, more than half of the newly public companies have accessed additional equity capital in follow-on transactions. Some companies are able to take advantage of this very effectively. For instance, Maxcyte listed in March 2016, raising £10 million from its IPO, and has since carried out placings in May 2017 and February 2019 to raise an additional £20 million and £10 million respectively. In order to list, the company’s capital structure will typically need to revert to common stock, so it is likely that there will be an element of pre-IPO restructuring to effect, particularly if the company already has institutional investors. It is also highly unusual for public market investors to take a board seat. The costs of listing and of remaining on market are significantly less than the usual costs involved in a U.S. IPO. For example, it is possible to list the Delaware company stock directly (through depositary interests) and for those companies to report under U.S. generally accepted accounting principles (GAAP). There are no Sarbanes-Oxley reporting requirements with which to comply, and companies are only required to report their results semi-annually (see below). The regulatory regime applicable to listing companies is also relatively flexible and gives latitude, for instance, for M&A activity without having to revert to shareholders, other than where further equity funding would be required or the transaction would otherwise constitute a reverse takeover. The UK listing process allows for investor feedback from the outset of the IPO process and deal research is usually published. There is also no regulatory review feature; instead, the nominated advisor, or “Nomad,” has to sign off on the admission document to the exchange. This means that the entire process can remain confidential until the company is confident the deal will close. As such, companies tend to get regular feedback throughout the IPO process as to how successful they will be when it comes to closing the fundraise. This, in turn, means that UK IPOs usually price within the range set forth at the beginning of the bookbuilding process. In general, the UK is a less litigious environment than the U.S., and this is reflected in the number of lawsuits brought against companies that have recently gone public in the U.S. versus in the UK. This also generally results in associated cost savings for directors and officers insurance. AIM companies are required to appoint and have a Nomad at all times. The Nomad is responsible for ensuring that the listed company complies with the AIM rules. In turn, the Nomads are regulated by the AIM exchange. An AIM company must prepare and publish annual audited accounts. The accounts must be prepared under international financial reporting standards (IFRS) for companies incorporated in the European Economic Area (EEA), but issuers incorporated in the U.S. may choose to adopt and report under U.S. GAAP. An AIM company must also prepare and publish half-yearly reports. There is no requirement for AIM companies to publish quarterly financial reports. In order to carry out a UK listing, the company will need to consider its existing board structure and may need to appoint additional directors to make it suitable for a listing. In general, and depending on the size of the company, it is likely that the company will need to have at least two independent, non-executive directors appointed. At least one member of the board will also likely need to have prior UK listing experience and be resident in the UK for investor access. Where there is one or more shareholder who has a significant interest in an AIM company, the company will usually enter into a relationship agreement with such shareholder(s) that will set forth how the company will be run and govern the relationship between the parties while the company is admitted to trading on AIM. This can demonstrate that the company has good corporate governance, will be run for the benefit of shareholders as a whole, and consequently is appropriate to be trading on AIM. Although there is no hard and fast rule on when a shareholder is deemed to be “significant,” anyone who holds (or is interested in) 30 percent or more of the share capital of the company will likely be considered to have a significant interest. AIM companies have a general duty to disclose without delay any inside or pricesensitive information. In addition, AIM companies must announce the following (among others): (1) details of substantial transactions and related party transactions; (2) reverse takeovers; (3) fundamental changes of business; (4) changes in directors, holdings of significant shareholders, Nomad, and broker; and (5) changes in accounting reference dates, legal name, and registered office address. For further information on AIM or any related matter, please contact Ross McNaughton (ross.mcnaughton@penningtons.co.uk). Ross McNaughton is a partner in the corporate team at Penningtons Manches LLP, based in the San Francisco office. He has extensive experience of a variety of public and private capital raisings, mergers and acquisitions and general corporate advice, having acted on a full range of transactions - from multi-billion acquisitions to strategic bolt-ons or disposals and main market listings to smaller capital raises. His expertise spans the technology, life sciences, financial and professional services sectors. He has strong links with the UK tech and life sciences communities, particularly in the ‘Golden Triangle’ of London-Oxford-Cambridge. Many investments into U.S. companies, including life sciences companies, now require filings with the Committee on Foreign Investment in the United States (“CFIUS”). CFIUS is an interagency committee, headed by the U.S. Treasury Department, which reviews investments for national security implications. Failure to make a mandatory filing can give rise to a civil penalty up to the value of the investment, in addition to other adverse consequences. As we have explained previously, this represents a momentous change. What are the origins of these new obligations? The Foreign Investment Risk Review Modernization Act (“FIRRMA”) and the Export Control Reform Act (“ECRA”) both were enacted in August 2018. A FIRRMA “Pilot Program,” effective on November 10, 2018, implements specific provisions of FIRRMA, particularly to require mandatory CFIUS filings for investments into companies involved with “critical technologies.” Relatedly, ECRA establishes a process to define “emerging technologies,” which is a category of “critical technologies.” Understanding the rules for mandatory CFIUS filings and the definition of “critical technologies” is important for any life science company or investor. To determine if an investment requires a mandatory CFIUS filing, the U.S. company and the investor should consider the four questions below. If the answer to any of these questions is “no,” then a mandatory filing is not necessary; however, a voluntary filing may still be prudent, as explained further below. 1. Is the investor a foreign person? If the investor is a foreign natural person, a foreign entity, a foreign investment fund, a foreign government, or a U.S. entity under the control of any foreign person or entity, it is a foreign person. In addition, if the investor is a U.S. fund with one or more foreign general partners (or foreign limited partners that have information rights or serve in more than a purely passive capacity), then there may be a foreign person and a mandatory CFIUS filing. 2. Is the investment into the U.S. business covered by the Pilot Program? 3. Does the U.S. business work with “critical technologies”? The regulations define “critical technologies” broadly, by reference to several categories of export-controlled technologies. Companies that deal in toxins, viruses, radiological equipment, hazardous clean-up equipment, and many other technologies may be covered by the definition of critical technologies; further, the use of encryption often yields a determination of “critical technologies.” Importantly, “critical technologies” includes the category “emerging technologies,” which are technologies that will be designated soon, as explained further below. 4. Does the U.S. business have customers or partners in a “Pilot Program industry”? If the U.S. business’s customers or partners that use the critical technology operate in a specified list of 27 industries—which includes research and development in biotechnology, among other areas—the U.S. business’s activities likely fall within the Pilot Program industry. If the answer to all four questions is yes, then a CFIUS filing generally is required at least 45 days before the investment closes. A “no” answer to any of the questions obviates a mandatory filing; however, it may still be prudent to consider a voluntary filing. CFIUS has jurisdiction to review any transaction—regardless of the technology—in which a foreign person gains control over a U.S. business. Control generally means ownership of greater than 10 percent voting interest with some additional power (e.g., a board seat, a veto over business decisions, or other right not typically possessed by minority shareholders). CFIUS can intervene in such transactions and impose restrictions on the U.S. business or even force an investor to divest. There is no statute of limitations. To eliminate the risk of CFIUS intervention, parties can make a voluntary CFIUS filing to clear the transaction before it closes. The process for a voluntary filing typically takes at least several months. Clearance is not guaranteed and may be subject to certain conditions on the transactions. As explained in a prior advisory, in November 2018, pursuant to ECRA, the U.S. Department of Commerce (“Commerce”) released an advance notice of proposed rulemaking (“ANPRM”)—the first of several steps toward implementing rules—to control the export of “emerging technologies.” Commerce identified 14 categories in which it seeks to determine whether there are emerging technologies of national security interest, including biotechnology and artificial intelligence. The possibility that broad swaths of life sciences technologies (and other technologies) could be subject to new export controls has at least two major implications: i) access to these “emerging technologies” by non-U.S. persons may be difficult or impossible, and ii) foreign investments into U.S. companies involved with these technologies may trigger mandatory CFIUS filings. To explain: the “emerging technologies” designations could result in “deemed exports” in those cases in which non-U.S. persons access the designated technologies. While obtaining licenses for such exports might be possible, licenses may not always be obtained in a timely manner. Further, as noted above, in many circumstances CFIUS filings must be made at least 45 days prior to foreign investments in “critical technologies.” Since the designation of “emerging technologies” will expand the set of “critical technologies” (the former being a subset of the latter) the scope of CFIUS review similarly will expand. The process of making these “emerging technologies” designations likely will take months, and perhaps more than a year, but the process warrants close monitoring because of its significant implications. Regardless of the outcome of that process, now and in the future life sciences companies and investors will need to consider the status of their technologies and potential obligations to make CFIUS filings. On February 7, 2019 Alector, a clinical stage biotechnology company pioneering immunoneurology, a therapeutic approach for the treatment of neurodegeneration, announced the pricing of its initial public offering of 9,250,000 shares of common stock to the public at $19.00 per share. The gross proceeds to Alector from the offering are expected to be $176 million. In addition, Alector has granted the underwriters a 30-day option to purchase up to an additional 1,387,500 shares of common stock to cover over-allotments, if any. The offering was expected to close on February 11. WSGR is representing Alector in the offering. For more details, please see https://investors.alector.com/news-releases/news-release-details/alector-announcespricing-initial-public-offering. On January 23, 2019 United Therapeutics and Supernus Pharmaceuticals obtained a favorable ruling in a case against the Director of the United States Patent and Trademark Office (USPTO) at the Court of Appeals for the Federal Circuit in an appeal from the U.S. District Court for the Eastern District of Virginia. The win secures at least an additional 1.5 years of patent term for United Therapeutics on its oral pulmonary hypertension drug, Orenitram. WSGR is representing United Therapeutics and Supernus Pharmaceuticals in the matter. To read more, please visit https://www.wsgr.com/WSGR/Display.aspx?SectionName=clients/0119-utc.htm. On January 18, 2019 iKang Healthcare Group, a major provider in China’s private preventive healthcare services market, announced that it has completed its merger with IK Healthcare Merger Limited, a special-purpose vehicle controlled by a buyer group consisting of certain founders and executive officers of iKang and affiliates of or funds managed or advised by Yunfeng Capital, Alibaba Group, and Boyu Capital. As a result of the merger, the buyer group acquired iKang in a cash transaction valued at approximately $1.5 billion. WSGR acted as U.S. legal counsel to the sponsors and as lead counsel to the buyer group in the transaction. For more information, please see https://globenewswire.com/news-release/2019/01/18/1702594/0/en/iKang-Announces-Completionof-Going-Private-Transaction.html?from=timeline&isappinstalled=0. Abbott announced on January 16, 2019 that it has exercised its option to purchase Cephea Valve Technologies, a privately held medical device company developing a less-invasive heart valve replacement technology for people with mitral valve disease. Financial terms were not disclosed. WSGR represented Cephea Valve in the transaction. For more details, please see https://www.prnewswire.com/news-releases/abbott-to-acquire-cepheavalve-technologies-inc-300779003.html. On January 7, 2019 10x Genomics, a company that develops a suite of gene imaging and analysis tools to enable the acceleration of genetic discoveries, announced that it has raised $35 million as an extension of its Series D round of financing. The round was led by Meritech Capital with participation from Fidelity and Wells Fargo. WSGR represented 10x Genomics in the transaction. More information is available at https://www.10xgenomics.com/news/10x-genomicslands-new-financing/. On January 4, 2019 Schrödinger, a privately held company revolutionizing drug discovery through advanced molecular simulations, announced the closing of an $85 million round of financing. The Bill and Melinda Gates Foundation Trust and WuXi AppTec’s Corporate Venture Fund co-led the round, with participation from Deerfield Management, Baron, Qiming Venture Partners, and GV (formerly Google Ventures). WSGR represented WuXi AppTec’s Corporate Venture Fund in the transaction. For more details, please visit https://www.marketwatch.com/press-release/schrodinger-closes-85-million-financing-toadvance-computational-platform-and-expanddrug-discovery-pipeline-2019-01-04. On January 1, 2019 Antengene, a clinical stage therapeutics company focused on oncology, announced that it has completed a $120 million Series B round of financing led by Boyu Capital and FountainVest, with participation from Celgene Corporation, WuXi Corporate Venture Fund, Taikang, Qiming Venture Partners, and TF Capital. WSGR represented Boyu Capital in the transaction. For more details, please visit https://www.prnewswire.com/news-releases/antengene-corporation-raises-120-million-inseries-b-financing-300771463.html. On December 12, 2018 the Patent Trial and Appeal Board invalidated two Sanofi-Aventis Deutschland GmbH patents for the insulin medication Lantus, clearing a significant hurdle towards marketing of Mylan’s proposed long-acting insulin glargine vial product. The PTAB ruled in favor of Mylan, finding all claims of the two Sanofi Orange Book patents relating to Sanofi’s Lantus vial product invalid for obviousness. WSGR is representing Mylan in the matter. For additional details, please see https://www.wsgr.com/WSGR/Display.aspx?SectionName=clients/1218-mylan.htm. On December 12, 2018 WuXi AppTec announced that it has listed approximately 116,000,000 H-shares on the Main Board of the Hong Kong Stock Exchange. Based on the offer price of HK$68 per share, the net proceeds to be received by WuXi AppTec are about HK$7,553 million, with assumption that the over-allotment option is not exercised. The company is a pharmaceutical and medical device open-access capability and technology platform company with global operations. WSGR acted as HK and U.S. counsel to WuXi AppTec in the Hong Kong offering. More information is available at http://www.wuxiapptec.com/press/detail/375/18.html. On November 29, 2018 Oxford Finance, a specialty finance firm that provides senior debt to life sciences and healthcare services companies, announced the closing of a $25 million senior secured term loan with Karius, a life sciences company transforming infectious disease diagnostics with genomics. Specific terms of the loan were not disclosed. WSGR represented Karius in the transaction. For more details, please visit https://www.prnewswire.com/news-releases/oxford-finance-provides-25-million-senior-debt-facility-to-kariusinc-300756967.html. Arena Pharmaceuticals and United Therapeutics announced on November 15, 2018 that they have entered into a global license agreement for Arena’s Phase 3 investigational drug candidate, ralinepag, a next-generation, oral, selective, and potent prostacyclin receptor agonist in development for the treatment of pulmonary arterial hypertension. Under the terms of the agreement, Arena will grant United Therapeutics exclusive, worldwide rights to develop, manufacture, and commercialize ralinepag. In return, Arena will receive up to $1.2 billion, including an upfront payment of $800 million and potential milestone payments totaling up to $400 million based on the achievement of certain regulatory events. WSGR represented United Therapeutics in the transaction. More information is available at https://www.prnewswire.com/news-releases/arena-pharmaceuticals-andunited-therapeutics-announce-global-licenseagreement-for-ralinepag-300751003.html. On November 13, 2018 Merit Medical Systems, a leading manufacturer and marketer of proprietary disposable devices used in interventional, diagnostic, and therapeutic procedures, announced that it has completed the acquisition of Cianna Medical, a developer, manufacturer, and marketer of innovative medical products designed to reduce costs, improve quality, and reduce the anxiety and stress breast cancer treatments place on women. Cianna Medical is now a wholly-owned subsidiary of Merit. The purchase consideration was an upfront payment of $135 million in cash with potential earn-out payments of an additional $15 million for achievement of supply chain and scalability metrics, and up to an additional $50 million for achievement of sales milestones. WSGR represented Cianna Medical in the transaction. For more details, please see https://globenewswire.com/newsrelease/2018/11/13/1650919/0/en/Merit-Medical-Closes-Cianna-Medical-Inc-Deal.html. On November 11, 2018 Harpoon Therapeutics, a clinical-stage immunotherapy company developing a novel class of T cell engagers, announced the closing of a $70 million Series C equity financing. WSGR represented Harpoon in patent and IP matters during the transaction. Read more details at https://www.businesswire.com/news/home/20181111005035/en/Harpoon-Therapeutics-Announces-Closing-70M-Series-Financing. On November 1, 2018 Illumina, a provider of sequencing and array-based solutions for genetic analysis, and Pacific Biosciences, a leader in long-read sequencing and provider of high-quality genomes to advance scientific discovery, announced that they have signed an agreement under which Illumina will acquire Pacific Biosciences at a price of $8.00 per Pacific Biosciences share in an all-cash transaction valued at approximately $1.2 billion. WSGR is representing Pacific Biosciences in the transaction. The transaction is expected to close in mid- 2019. More information is available at https://www.pacb.com/press_releases/illumina-to-acquire-pacific-biosciences-forapproximately-1-2-billion-broadening-accessto-long-read-sequencing-and-acceleratingscientific-discovery/. Denali Therapeutics, a biopharmaceutical company developing a broad portfolio of therapeutic candidates for neurodegenerative diseases, announced on November 1, 2018 that it will collaborate with Sanofi on the development of multiple RIPK1 inhibitor molecules with the potential to treat a range of neurological and systemic inflammatory diseases. Under the terms of the agreement, Sanofi will make an upfront cash payment to Denali of $125 million, with future development and commercial milestone payments that could exceed $1 billion. WSGR represented Denali in the transaction. For more details, please see https://globenewswire.com/news-release/2018/11/01/1640771/0/en/Denali-Therapeutics-Announces-Broad-Collaboration-with-Sanofi-to-Develop-RIPK1-Inhibitors-for-the-Treatment-of-Neurologicaland-Inflammatory-Diseases.html for further details. On October 31, 2018 Gilead Sciences and Tango Therapeutics, a company focused on the discovery and development of novel cancer therapies, announced a global strategic collaboration to discover, develop, and commercialize a pipeline of innovative targeted immuno-oncology treatments for patients with cancer. Under the terms of the agreement, Tango will receive an upfront payment of $50 million. Tango will also be eligible to receive approximately $1.7 billion in total additional payments across all programs in the form of pre-clinical fees and development, regulatory, and commercial milestone payments. WSGR represented Tango Therapeutics in the transaction. For more details, please visit https://www.businesswire.com/news/home/20181031005225/en/. Avinger, a commercial-stage medical device company that designs and develops the firstever image-guided, catheter-based system that diagnoses and treats patients with peripheral artery disease, announced on October 30, 2018 that it has priced an underwritten public offering for gross proceeds of approximately $10 million. WSGR represented Avinger in the offering. For more details, see https://www.marketwatch.com/press-release/avingerannounces-pricing-of-10-million-underwrittenpublic-offering-2018-10-30. Charles River Laboratories International announced on October 25, 2018 that it has entered into an exclusive partnership with Distributed Bio, a leader in the computational design and optimization of antibody discovery platforms. The partnership will grant Charles River’s clients access to Distributed Bio’s antibody libraries and integrated antibody optimization technologies. WSGR represented Distributed Bio in the transaction. For more details, please see https://www.businesswire.com/news/home/20181025005076/en/Charles-River-Distributed-Bio-Enter-Exclusive-Partnership. On October 23, 2018 Stryker announced that it has completed its acquisition of Invuity, a leader in advanced photonics and single-use, lighted instruments that deliver enhanced visualization for a wide variety of clinical applications including orthopaedic and spine surgery, general surgery, and women’s health procedures, and is a recent entrant into the enhanced energy market. Under the terms of the transaction, each outstanding share of Invuity common stock has been converted into the right to receive $7.40 in cash, without interest, subject to any required withholding taxes, implying a total equity value of approximately $190 million. WSGR represented Invuity in the transaction. For more information, please visit https://www.massdevice.com/stryker-closes-190m-invuitybuyout/. Carl Zeiss Meditec announced on October 23, 2018 that it has entered into an agreement to acquire IanTECH. Headquartered in Reno, Nevada, IanTECH is a privately held company focused on technology solutions for microinterventional cataract surgery. Terms of the deal were not disclosed. WSGR represented IanTECH in the transaction. To read more, please see https://www.prnewswire.com/news-releases/carl-zeiss-meditec-to-acquireiantech-inc-to-expand-its-portfolio-in-cataractsurgery-300736138.html. On October 10, 2018 Kodiak Sciences, a clinical stage biopharmaceutical company specializing in novel therapeutics to treat chronic, high-prevalence retinal diseases, announced the closing of its initial public offering of 9,000,000 shares of common stock at a price to the public of $10.00 per share for a total of $90 million in gross proceeds. WSGR represented Kodiak Sciences in the offering. For more details, please see http://ir.kodiak.com/news-releases/news-release-details/kodiak-sciences-inc-announces-closing-initialpublic-offering. On October 1, 2018 Ra Medical Systems, a manufacturer of laser-based solutions for the treatment of cardiovascular and dermatological diseases, announced the closing of its initial public offering of 4,485,000 shares of common stock, which includes the full exercise of the underwriters’ option to purchase 585,000 additional shares of its common stock, at a price to the public of $17.00 per share. WSGR represented Ra Medical Systems in the offering. For further information, please see https://ir.ramed.com/press-releases/detail/21/ra-medical-systems-announces-closing-ofinitial-public. Maven, a digital health company focused on bringing women and families better access to healthcare, announced on September 26, 2018 that it has raised $27 million in a Series B round of financing led by Sequoia Capital and Oak HC/FT, with participation from existing investors Spring Mountain Capital, 14W, and Female Founders Fund. The new round of financing will help Maven enhance its flagship product, Maven’s Family Benefits platform, which supports working mothers and new parents with everything from fertility through return-to-work care. WSGR represented Maven in the transaction. More details are available at https://blog.mavenclinic.com/for-business/series-b-announcement. Ceribell, a company that is focused on making EEG widely available, more efficient, and more cost effective to improve the diagnosis and treatment of patients at risk for seizures, announced on September 25, 2018 that the company has completed a $35 million Series B round of financing led by new investors Optimas Capital Partners Fund and The Rise Fund, with participation from UCB and LivaNova. WSGR represented Ceribell in the transaction. More information is available at https://www.prnewswire.com/news-releases/ceribell-announces-completion-of-35-millionseries-b-financing-300717976.html. Samumed, a leader in medical research and development, announced on September 17, 2018 that it has entered into an exclusive license agreement with United Therapeutics for North American rights to Samumed’s SM04646, which is being developed for the treatment of idiopathic pulmonary fibrosis. Deal terms include $10 million up-front, plus up to $340 million in developmental milestones. WSGR represented United Therapeutics in the transaction. More information is available at https://www.prnewswire.com/news-releases/samumed-and-united-therapeutics-announcenorth-american-license-agreement-forsamumeds-ipf-drug-candidate-300713382.html. On September 14, 2018 IRIDEX, an ophthalmic medical technology company focused on the development and commercialization of breakthrough products and procedures used to treat sight-threatening eye conditions, announced the pricing of its underwritten public offering of 1,666,667 shares of its common stock at a price to the public of $6.00 per share. In addition, the company granted the underwriters a 30-day option to purchase up to 250,000 additional shares of its common stock in the public offering. WSGR represented IRIDEX in the offering. For additional details, please see https://globenewswire.com/news-release/2018/09/14/1571046/0/en/IRIDEX-Announces-Pricing-of-Public-Offeringof-Common-Stock.html. Wilson Sonsini Goodrich and Rosati’s 27th Annual Medical Device Conference will feature industry experts discussing key issues facing today's early-stage medical device companies. Through a series of topical panels, attendees will hear from industry CEOs, venture capitalists, industry strategists, investment bankers, and market analysts. The conference will kick off with a dinner on June 20. The 26th Annual Phoenix Conference will bring together top-level executives from large healthcare companies and CEOs of small, venture-backed firms for an opportunity to discuss critical issues of interest to the medical device industry today, as well as to network and gain valuable insights from both industry leaders and peers. This exclusive, two-day event will provide an unrivaled experience that will help inform and shape company strategy for the years ahead. The rEVOLUTION Symposium has become the place to discuss the most important strategic problems facing pharma and biotech CSOs. We will examine the organization and management of R&D to uncover new disruptive discovery and development models and assess the continued impact of pricing, reimbursement, regulation, and globalization on our industry. Casey McGlynn, a leader of the firm’s life sciences practice, has editorial oversight of The Life Sciences Report and was assisted by Philip Oettinger, Elton Satusky, Scott Murano, and James Huie. They would like to take this opportunity to thank all of the contributors to the report, which is published on a semi-annual basis.